A refreshing science fiction tale of hatred, love and mysteries. "Rebirth and Death", "Betrayal and Hopelessness", "Truth and Destruction", "Bravery and Love" - these are some of the elements of life that we experience in our lives, at one point or another. But through the experienced hands of Katayama Ichiryou and Yatate Hajime, who was responsible for the original concept works from well known series such as Cowboy Bebop and Mugen no Ryvius, they become the themes from one of Sunrise's biggest hit in their first quarter line-up in 2001 - a circle of life which the characters of Argent Soma (literal meaning : "Silver Flesh") must go through over their 25 episodes journey. The major differences that set Argent Soma apart from the rest of the sci-fi series is the way it was presented. Unlike most commonly seen science fiction anime, the story itself was brought to life; not with unbelievable mechanical designs or robot fighting scenes, but through the life of an unlikely hero, a young man without a past and a burning hatred toward the mysterious alien life forms that kept on coming down from the skies above ever since the year 2054. You are almost garenteed to see a mecha fight before the end of the first episode in almost all of the sci-fi anime today, used as a tool to draw the audiences' attention and to keep them interested. However in Argent Soma, the real battle does not begin until episode three. Instead of using big explosions to catch attentions, the Sunrise introduced the series to its viewers by starting it off with an unexpected event surrounding a young man and "Frank" (short for "Frankenstein"), an artificially recreated alien life form pieced together with alien remains. The year is now 2059, five years had passed since the first contact with the alien species. 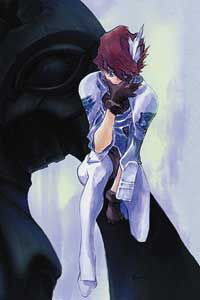 Arriving at the headquarters of the world's biggest anti-alien agency "Funeral" is Ryu Soma, a young man without a past. Dispite Dan Shimonz's endless attempt to probe into Ryu's past (one who slowly begin to replace his position in the team as the ace pilot since the beginning), he found nothing more about the new stranger who joined the anti-alien mobile quad than the long visible scar on his cheek. Two things were certain however, Ryu Soma is a talented Jark pilot and he posses an unconditional burning hatred toward the alien race, including Frank which had become the property of the alien countermeasure agency "Funeral" since the initial accident that took place at the beginning of the series. And the opening song "Silent Wind" (preformed by Sugai Eri) is most certainly a song that helped bring out the desired atmosphere in the series, slow and sad at the first half and then back to the usual powerful tone that we come to expect from science fiction animes, with meaningful anime sequences about the Angel that felt down from Heaven onto Earth integrated throughout the short clip. On the contrary, the ending theme song is almost on the opposite end of the scale - "Horizon", an absolutly energetic, inspiring pieces (preformed by Sphere) with a simple but catchy tone that tells the life-long dream and the way things 'would've been' for a certain character if the aliens never came.